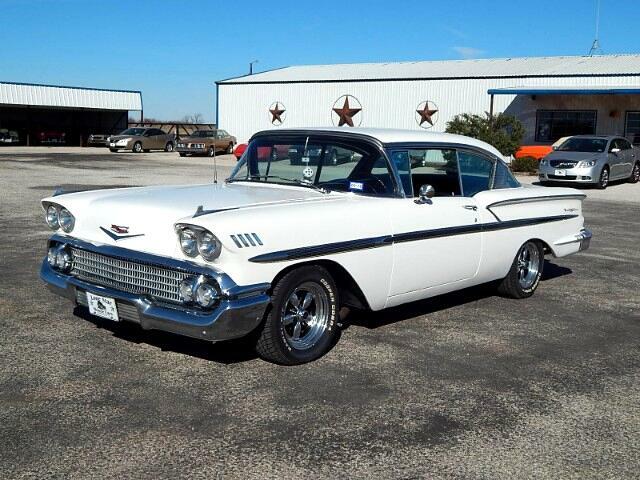 1958 Chevrolet Bel Air Two Door Hard Top Powered By A Small Block 350 with a turbo 350 automatic transmission. Power front disc brake's and Power steering. You Can Drive this car anywhere very dependable Classic. The Paint is Driver quality on the exterior and the Chrome and stainless are all intact and good shape. This car is a super driver or an excellent candidate for a restoration for that ultra show car. Message: Thought you might be interested in this 1958 Chevrolet Bel Air. All Payments Shown Are With W.A.C. @ 7.25 At 96 Months Outside Finance Source. Tax, Title, Registration Extra All Texas Residents T.T.L. Due At Time Of Sale. We Offer No In House Financing. See Dealer For Detail.